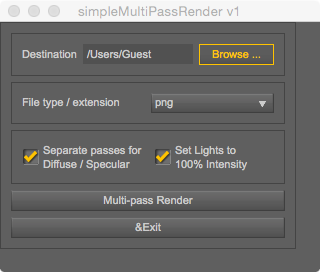 Since I can't find a free script to do a multi-pass rendering, I just write one for everyone. Unzip, then put this script under your Content->Script folder. When using, it will automatically render each light into different images, nothing more. Just made a little change from mCasual/Jacques's mcjListRender.dsa, thanks for his amazing work, really helps much. Thank you very much! Works fine! A chap calling himself Pendragon had a script very like this for DS2 in the old fora. Nice. Thank you so very much; I'm trying this now. I love the amount of control this shows you can have and I am delighted that your script goes through and renders per light. I really appreciate your sharing this. I just discovered a problem with the script! It works perfectly witht the DAZ standard lights, but it does NOT work with the AoA Advanced lights! I have set up a small scene for testing and added 3 Advanced spotlights. Then rendered with the script. But when the first image (light) is finished, the script asks me if I want to overwrite the next file with the previous one. When I click on no, the script stops. Why is that? I have named the lights differently in the scene tab, but that does not help. It seems the script gives all Advanced spots the same name, so it tries to overwrite them. It works perfectly with the DAZ standard lights, but it does NOT work with the AoA Advanced lights! I opened up butaixianran's wonderful script and, fingers trembling, made a couple of minor changes to it. Now it includes the internal light number as a part of the output file name, which *fingers crossed* I hope will mean no more name collisions for things like your AOA advanced light. I've also tweaked it so that only lights which are set to visible at the start of the run are processed, and all light visibility is restored to original settings at the close of processing. I'd love to be able to figure out how to query a scene for a list of luminous surfaces and to process those in a separate layer, but this is the first time I've touched DAZScript, so that's way, way above my understanding at the moment. I noticed a white border on the textures it creates; wonder if there is a way to avoid that? Hm, that's weird. From what I could decipher, the script doesn't touch anything in your render settings except the output option, to point to the different files as it creates them. I wonder if it could be something else in your settings that was already there, like your shading rate or some such? Cris hangs her head in shame for not noticing she put a response in the wrong thread. I arrived late, so I missed dhtapp's changes (they're gone from dropbox). I have made some minor cosmetic changes and added the rendering of a mask (no lights). I find it useful when I'm adding a background in post. I've also made some minor tweaks to the GUI. Anyway, since my sort (engineer) is the sort to do such things, I placed the source on GitHub. I'm rather new to DAZ Studio, and I've noticed a lot of really cool freebies seem to disappear from the net or die of bit rot. This is my attempt at keeping that from happening here. OK, It now supports separate specular and diffuse passes. It also has an option to set the light intensity to 100% before rendering. Both options can be disabled from the dialog. Like a number of others I've seen on these forums since, I purchased the ReLight product full of hope. Unfortunately, the product hasn't been supported in quite some time and doesn't function under DAZ Studio 4.7. I own DreamLight's LDP-R and like it a lot, but sometimes I want a bit more control. A bit more searching turned up butaixianran's freebie script in this forum post (http://www.daz3d.com/forums/discussion/38514/) which is in turn based on mCasual/Jacques’s mcjListRender (https://sites.google.com/site/mcasualsdazscripts/mcjlistrender-for-ds-1-2-3-4). Since it's under the MIT license, I took the script and ran with it. I've recently started using DAZ Studio, and have been looking for an excuse to learn to script it. I've spent two evenings hacking on it to do what I wanted and modified the user interface to suit my tastes. I've made it available on GitHub (https://github.com/esemwy/SimpleMultiPassRender). I'm sure it can do more, but I need ideas, and testers, and even code contributions. Right now, it's only tested on what I have, which is 4.7 on OS X Yosemite. Anybody else interested in helping out? Either way, I'm going to use this topic as I make updates in the hope that it will be useful to others. Just downloaded this, and installed to the Scripts folder in DS4.7, and ran it from there. It produces 3 renders, Diffuse, Specular and Mask, and works without a hitch on Win 7. The Script doesn't 'remember' the last used location, which would be handy, and I can't seem to name my renders either, so it asks to overwrite the previous. I realise that it is early days yet, not complaining in the slightest, jut testing. Thank you very much for doing this, it all works out of the box as it were, so you are spot on so far. Cool. I'll add Win7 to the compatibility. I found that an earlier version had the ability to specify a prefix to the renders. As you suggest, that would probably be useful to most people. I tend to do a directory per render, but that's probably just my experience with LDP-R. There's no reason to head down the same path here. As per saving previous settings, I know there's a way to do it, but I haven't found it in the docs yet. I also need to find a way to save and restore the previous render settings, so that it doesn't do direct to file when I'm trying to preview. Updated to save preferences in a JSON file in the same directory with script. Added file prefix for those that don't want to keep creating new directories or overwriting files. Might be worth a mention that anyone confused with the .md file type for the ReadMe and ToDo files; they're Markddown files [text files that can be read on MAC, Win & Linux]. Esemwy; you mentioned adding a JSON file to store preferences; am I stupid (don't answer that - I probably won't like the answer...) - is it part of the .dsa file of have you not added it to the download yet? I already added the preference feature. The script (.dsa file) creates a .conf file the first time it runs that saves your selections. 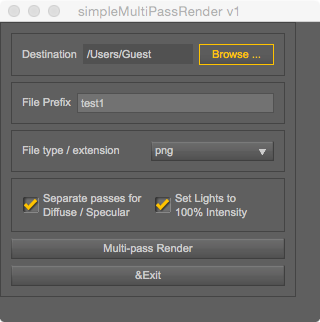 If you browse to the directory where the script is stored using Explorer/Finder you'll see SimpleMultiPassRender.conf once you've used the script once. Guess I forgot to update the TODO when I made the last change. That means I'm out of features to implement. Suggestions? Anybody? I just gave the script a go and it works quite nicely. A thought (warning - danger); what about rendering the passes without the background and having the mask render remain as is (ie. with the background). Either the render passes could be rendered without any background (leaving possible file formats to PNG * TIFF); or on black (keeping all current file format possibilities). I got this idea from Dreamlight's "Light Dome Pro - R; which has a render option that renders out Background, Ambient, Sky Bounce, Sky (ie, light from), Sun Bounce & Sun (ie. light from). I at least got so far as to update the TODO list. As I understand it, both items will require me to figure out the controls for UberEnvironment. I need to turn the background on and off, make sure I'm handling the UE light correctly, then hide everything else in the scene to render the background. I think I need to make all of that optional as well. I also want to take a look at lighting controls for Iray to determine whether multi-pass rendering even makes sense in that context. No idea how long it will take me with my normal workload, but I'll give it a shot. I don't konw why I havn't got any email for any new post of this topic. But I'm so glad it's now a github project and thanks for Esemwy's hard work. I'll keep watching on that project. Well, a year has gone by; I'm trying to get canvases to work for Iray but I'm not having much luck (the exr file format appears to bypass any and all filtering and I end up with lots of fireflies on each light pass render and very little idea as to what to do about it). Is this effort now totally dead? It may not work with iray, and I don't even remember how to write a daz script anymore...so seems it is useless now. I haven't looked at the script since the advent of Iray. I'll give it a look once I'm home from the holidays. It certainly wasn't designed for Iray, but it may have some utility with photometric lights. I'll let you know.